Iceland are looking forward to showing they deserve to be at the World Cup, says the country's all-time leading scorer Eidur Gudjohnsen. 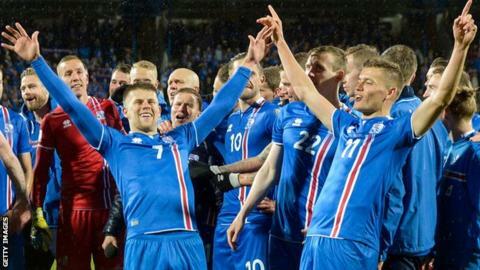 With a population of just 335,000, Iceland are the smallest nation ever to qualify for the tournament. They face a tough game on their World Cup debut against Argentina on Saturday (14:00 BST) but Gudjohnsen is confident Iceland will not let themselves down. "We're in a very good place at the moment," added the ex-Chelsea forward. Iceland were a revelation at Euro 2016, emerging unbeaten from their group before beating England to reach the quarter-finals in France. Heimir Hallgrimsson's side qualified for Russia after finishing top of a group including Croatia, Ukraine and Turkey. "It's an historic moment. Since Euro 2016 it's been one success after another," added Gudjohnsen, speaking to BBC Sport. "I don't think people can start talking about luck any more. We're look forward to hopefully showing the world again we fully deserve to be there." Iceland, 22nd in Fifa's world rankings, face Nigeria in Volgograd on 22 June (16:00 BST) before taking on Croatia in Rostov-on-Don on 26 June (19:00 BST).